“It is a pleasure building ships for Olympic, a demanding customer who provides plenty of input so we can deliver even better ships. 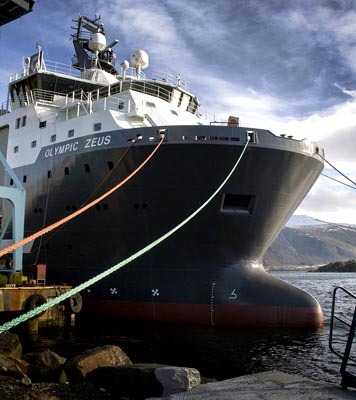 The Olympic Zeus is an excellent case in point,” says Karsten Sævik, managing director of Ulstein Verft. The Olympic Zeus and the upcoming sister ship Olympic Hera are of the ULSTEIN A122 type by Ulstein Design – the largest anchor handling vessels of this design ever contracted at Ulstein Verft. The vessels are the first with hybrid solution developed by Ulstein Design. The hybrid system allows the ships to switch between dieselmechanical and diesel-electric propulsion or combine the two for maximal pull and optimum fuel efficiency. This gives the ships a huge economic and environmental edge in their sphere of operation. The Olympic Zeus is a state-of-the-art vessel capable of performing demanding marine operations at major depths. With one large 500-tonne and two 450-tonne drums, the Rolls-Royce winch has an enormous capacity. Ulstein Elektro has also made extensive equipment deliveries to the ship, including ULSTEIN COM®, ULSTEIN IAS®, switchboards, consoles, motor control centres (MCC), engine starters and navigation and communication equipment as well as installation. The vessel is prepared for a 250-tonne offshore crane and two A-frames of different types. The ship has DP2 (dynamic positioning), a ROV garage and accommodations for 68 persons. It is 93.8 metres long and 23 metres wide and has a towing power of some 250 tonnes.